Reminiscent of castles, European and French house plans have quite a romantic feel. Luxury is implied from the first glance, as this architectural style is best suited for large homes. The expansive exterior is often clad in brick or stone, with accents of polished wood or interesting metals such as copper. The dramatic facade boasts many intersecting rooflines and gables, which lends an impressively elegant air. Typically, European or French homes are multiple stories, with living and entertaining areas on the ground floor, and sleeping quarters above. If elegance and implicit luxury are to your liking, then perhaps European or French architecture might be exactly your style. 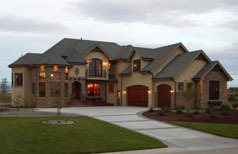 There are many sub-styles of European architecture, and AmazingPlans.com has an unmatched inventory for you to peruse. Multiple roof lines and gables. Generally has a stone or brick exterior with interesting accents. Most often designed for large, two-story homes. Sense of luxury inside and out. Click here to search our entire inventory of European and French Country House Plans! Not the style you're looking for? Try our Advanced Search to find the right house plan!